Finally! Pet care information for owners of rabbits, snakes, and hedgehogs. Look at that face. Look at that face! Hedgehogs are adorable, and can make wonderful, fun-loving pets. But they, like other exotics, require specific kinds of care, and while there’s no shortage of pet care information for cats and dogs, reliable information about exotics like hedgehogs, snakes, and rabbits can be hard to come by. Let’s take a look at some different kinds of exotic pets, and what it takes to care for them. It might come as a surprise that rabbits are considered exotics. They’re among the top five most popular pets in the United States and are hardly a rarity. But in terms of medical treatment, they’re still classified as exotic pets. What this means, first and foremost, is that they need a specialized vet. Many general veterinary practitioners don’t treat rabbits, so if you’re considering a rabbit as a pet, it’s important to look for a rabbit vet, a small animal vet, or a general vet that treats rabbits. A rabbit vet will be aware of health issues specific to rabbits and will be up-to-date on the latest treatments. They can also give you important pet rabbit care information that a general vet might not be able to. Before adopting a rabbit you should read, research, and learn as much as you can on your own. With any pet, it’s important to make sure that this is the right pet for you. Should bunnies live indoors or outdoors? There are two schools of thought on keeping pet rabbits. One is that rabbits should be kept exclusively indoors. The reasons for this are that rabbits are social animals and need to live with their adoptive families. In addition, indoor rabbits are safer from predators and weather extremes. The House Rabbit Society is a great source of pet care information, rabbit veterinarian listings, indoor rabbit care tips, and health information. Other people believe that, because wild rabbits are outdoor animals, pet rabbits are happiest outdoors, with a large hutch and outdoor run, where they can participate in natural rabbit behaviors like digging and foraging. In addition, outdoor rabbit proponents say, the indoors holds as many dangers as the outside, including electrocution (bunnies love to chew on power and data cords) and poisoning. 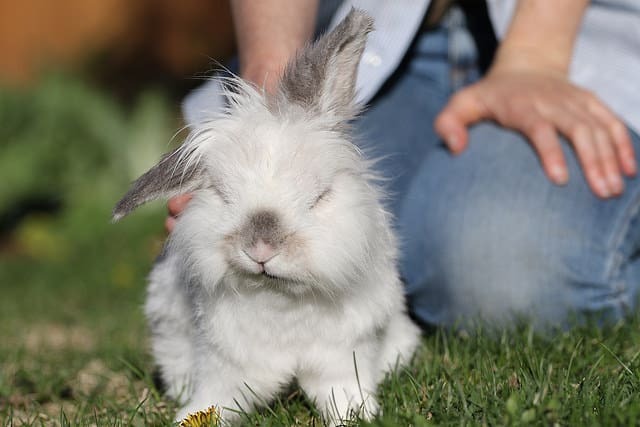 The Humane Society has a wealth of pet rabbit care information for both indoor and outdoor rabbits. Size: Most rabbits measure eight to twenty inches in length, and weigh 4-8 pounds. Some rabbits get quite a bit larger. Sociability: Rabbits are social animals, and need companionship and daily interaction, either with humans, with other rabbits, or both. Although a single rabbit can live happily at the center of a family group, most sources say that a male-female pairing, or a group living arrangement, is the happiest. Enclosure: Rabbits need to be able to run, jump, and perform other natural functions. Whether indoor or outdoor, the minimum enclosure size should be 12 square feet (length by width) of living space, plus 32 square feet of exercise space. You can find more detailed pet rabbit care information here. It’s important to rabbit-proof any area where your rabbit will be so that they don’t dig out and escape, or get into something that might harm them. Rabbits are prey animals and need a “hide” – a box or other enclosed space out of sight where they can go when they’re feeling shy. Food: Rabbits should eat mostly fresh hay — either timothy, grass, or oat hay. They also enjoy fresh vegetables. Rabbits love fruit, but the high sugar content means that too much can hurt them. You can find a partial list of rabbit-safe vegetables here, along with other pet care information. Common health problems: Digestive problems, such as gas or diarrhea, can be deadly for rabbits. Overgrown teeth are also common. Many rabbit health problems are caused by poor diet. Rabbits are also very sensitive to heat and should be brought indoors if temperatures reach more than 85 degrees Fahrenheit. In general, if your rabbit is listless, panting, grinding its teeth, not eating, or is acting “off,” it’s important to get her to the vet immediately, as problems – especially digestive problems — can become very serious very quickly. You can read about common rabbit health problems and their symptoms, and other pet care information here. Spay or neuter: Yes! The expression “multiplying like rabbits” is based in fact. Rabbits are prodigious breeders. Also, spaying and neutering can reduce territorial aggression in both males and females, and can reduce your bunny’s chances of developing certain diseases. Vaccinations: In some places, like the United Kingdom, rabbits receive vaccinations like cats and dogs. In other places, like the United States, they do not. Check with your vet regarding vaccinations and other pet care information. Emergency care: Rabbit health problems can become very serious very quickly. If you suspect your rabbit is ill, it’s best to take him or her to the vet immediately. Experienced rabbit owners who recognize the symptoms of specific problems might consider keeping a basic rabbit first aid kit on hand. Snakes are another popular exotic pet. They are beautiful, quite a few are docile and easy to care for, and many people find their smooth, plastic-like texture pleasing. In addition, if handled often, they can learn to enjoy human contact. Garter snakes are one of the most popular snakes amongst beginners, along with the rosy boa and the ball python. Like rabbits, however, snakes require a specialized vet. The Association of Reptilian and Amphibian Veterinarians maintains a searchable database of reptile veterinarians around the world, as well as pet care information for snakes and reptiles. In addition, Reptiles Magazine has detailed snake pet care information sheets, as well as articles about keeping snakes and other reptiles. Size: Various. Blind snakes and ringneck snakes are about as thin as a pencil and can curl up in your hand. Other pet snake breeds can grow to be three to five feet or longer. Some pet breeds can grow to over 500 pounds! Lifespan: Snakes, like birds, can be very long-lived. If you bring a snake home, prepare to care for it for ten to twenty years – or more, depending on the breed. Sociability: Snakes are solitary animals and should be housed alone. First, if you house snakes together, not only will one will become dominant, but that dominant snake will not allow the submissive snake or snakes to eat. In addition, cannibalism is common among snakes. Finally, certain diseases can take three to six months to manifest. Introducing a new snake to an existing enclosure without a proper quarantine period puts all snakes in the enclosure at risk. Pet-Snakes.com has an excellent array of articles and snake pet care information on this and other topics. Enclosure: A snake enclosure should be no less than three quarters as long as the snake’s body from nose to tail. Active breeds will need more space. You can make enclosures from plastic, glass, wood, or wire. Different snakes have different needs, but many breeds will need a heat source, a light source, and regulated humidity. The enclosure will also need bedding or substrate. What kind of substrate — common types include cypress mulch, newspaper, and wood shavings — depends upon the breed. You can read about snake enclosures and other pet care information, in more detail at DrsFosterSmith.com. Food: Snakes are carnivores. Typically a rat or mouse makes a good meal for a snake (PetMD.com recommends pre-killed over live rodents for safety reasons). Most snakes eat only once a week or every two weeks. They also need a shallow bowl of drinking water in their enclosure. See PetMD.com for more pet care information. Common health problems: Snakes are susceptible to “mouth rot” and blister disease, both of which stem from poor nutrition and/or dirty enclosures. There are also a variety of snake-specific viruses, bacteria, and parasites. As with many animals, difficulty moving, diarrhea and/or loss of appetite can be indicators of very serious illness. The VCA hospitals site has an excellent article on snake diseases and other snake pet care information. Spay or neuter: No. Snakes live alone, and should only be put together when breeding is desired. Occasionally a vet recommends spaying a female snake due to health problems. However, it’s not a standard operation like it is with cats and dogs. Vaccinations: No. If snakes are housed alone, the spread of disease is not much of a concern. Snakes can spread diseases like salmonella to humans, however, so always make sure to wash your hands before and after handling them. You can find a description of a snake first aid kit and other pet care information here. 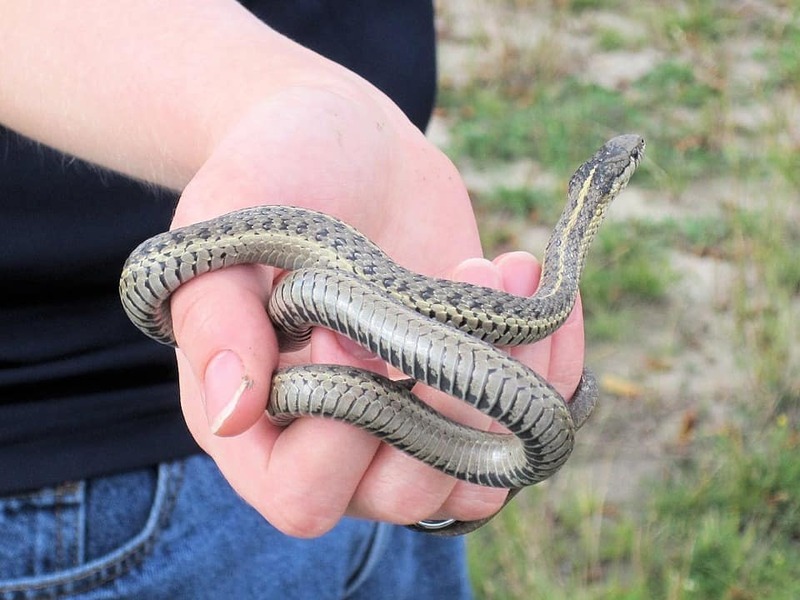 Emergency care: PetMD.com has a series of excellent articles about snake veterinary emergencies, including burns and rodent bites. However, if you believe your pet snake is experiencing an emergency, be safe and take him or her to a snake vet immediately. Image: CC By 2.0 David Goehring via Flickr. It’s becoming less common to see hedgehogs in the garden, but much more common to see them as pets. Hedgehogs are cute, clean, quiet, and easy to care for. They don’t have dander, so many people with pet allergies find them easy to tolerate. And, despite their prickly appearance, they are generally docile and non-aggressive in nature. 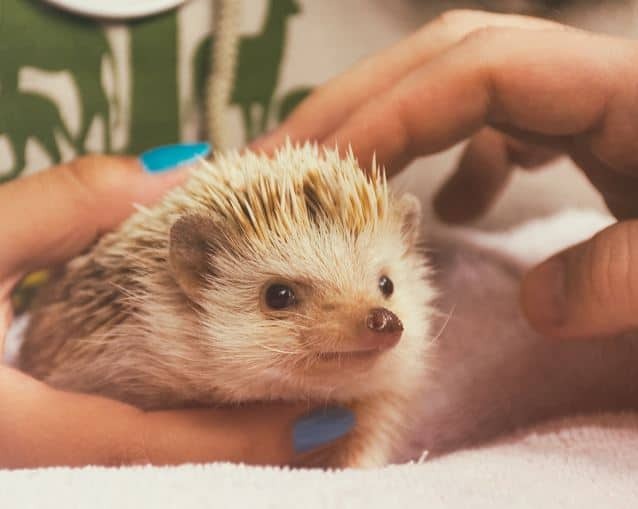 Again, like snakes and rabbits, hedgehogs require specialized veterinary care from an exotic animal vet or a small animal vet. 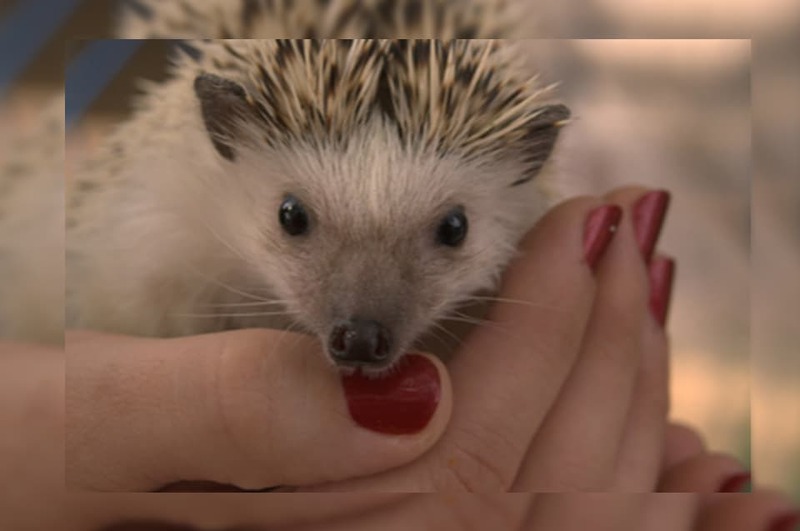 HedgehogHeadquarters.com has a wealth of hedgehog pet care information for your further reading. Size: Hedgehogs are small enough to hold in the palm of your hand – carefully. They have spines! They generally grow to about six to eight inches in length. Lifespan: Typically, hedgehogs live four to six years, though pet hedgehogs have been known to live up to nine years. Sociability: Like a hamster or other pocket pet, hedgehogs can be conditioned to enjoy being held. Hedgehogs are considered solitary, though two females can sometimes live in the same area. Hedgehogs can be grouchy, especially during quilling. They are also nocturnal. Enclosure: Hedgehogs are small but they are very active! This means that they need a large enclosure – at least four feet long and two feet wide, with pulp or recycled paper for bedding. They also need a water bottle and non-spill containers for wet and dry food. Your hedgehog will be happiest if it has an exercise wheel and some toys such as tubes and balls. And, believe it or not, hedgehogs use a litter box! For more hedgehog-specific pet care information, visit Hedgehogcare.org. Food: Hedgehogs are omnivores. Many people feed their hedgies high protein cat food made from meat or chicken. For treats, hedgehogs may enjoy insects such as crickets or mealworms, as well as beans, peas, corn, apples, grapes, and carrots. Common health problems: Hedgies are prone to cancer, unfortunately. They may also suffer from fleas and other parasites, from ear infections, and from bloody noses and feet caused by contact with rough cage surfaces. They can also suffer from digestive obstructions, respiratory infections, and diseases of the teeth and gums. You can read more about hedgehog health and other hedgehog pet care information here. As always, if you suspect your hedgie is ill, seek veterinary attention immediately. Spay or neuter: If you are keeping a single hedgehog, you do not need to spay or neuter. However, if you’re keeping more than one together, Dr. Ariana Finkelstein recommends it. Vaccinations: Nope! Although hedgies, like all pets, should have regular veterinary visits. Emergency care: As with any pet emergency, time is of the essence. It’s important to have a hedgehog vet lined up, just in case. HedgehogWelfare.org maintains a list of veterinarians who treat hedgehogs in the United States and around the world. They are also an excellent source of pet care information for hedgehogs. Exotic pets can be an adventure and a delight. But, as with all pets, it’s important to understand how to take care of them and to have a veterinarian at hand for regular care and in case of emergencies. And, as always, do your research. Featured image CC 2.0 Lisa Rock Photography via Flickr.